They have a great changing places, which is well used. 1 carer getting in free. We were very excited about our visit to the Theatre of Dreams, Old Trafford. Although I had visited the stadium many moons ago, things had certainly changed. We travelled up from Dorset and arrived at the ground early. Parking was no problem. This was arranged prior to our visit. We were situated in a large car park (E2) close to the stadium on Sir Matt Busby Way. I think the first thing to say is that all the staff we met were very friendly, helpful and a credit to Manchester United. Prior to the match we wandered around the stadium and sought advice from staff in the ‘Here to Help’ Booths. We entered the stadium via the Ability Suite, which was impressive. The entrance is at Entrance B3 in the South-East corner of the stadium. There’s a red disabled persons sign over the entrance. In the Ability Suite, there was a TV, food available with a low counter for wheelchair users and three people serving! Yes, three people serving! Great! There were two accessible toilets in the suite and just outside of the Suite, apparently there were a further 8 accessible toilets. What I liked was the fact that there was lots of room outside of the suite and you could move around easily. There was not a congestion of able-bodied fans getting in your way and you had a clear view of the match. According to MUDSA’ website the stadium holds ‘120 wheelchair places are situated in three separate locations around the stadium’. Evidently there were 12 wheelchair seats for away supporters and my brother, who acts as my carer, was able to sit alongside me. According to Level Playing Field ‘under existing minimum standards for accessible stadia, the club should have 280 wheelchair spaces (238 home and up to 42 away). 75% of these should be elevated positions and the remaining 25% pitchside’. 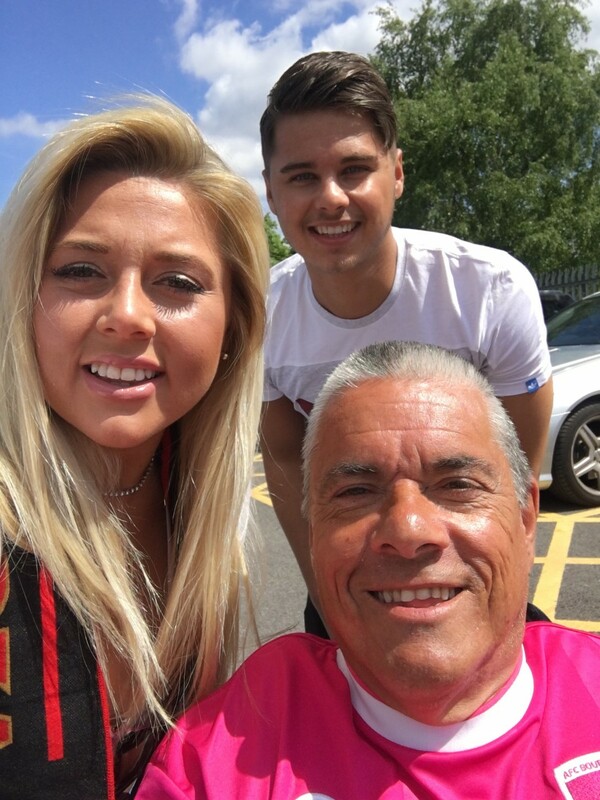 When you look at AFC Bournemouth’s allocation, Level Playing Field state ‘Home supporters have 156 spaces for wheelchair users available to them, and these can be found at pitchside and on raised platforms. 26 spaces for wheelchair users 26 spaces for wheelchair users can be found at pitchside in the away section for away supporters’. AFC Bournemouth’s capacity is 11,464 and Manchester United capacity is 75,635. There appears to be an anomaly here! 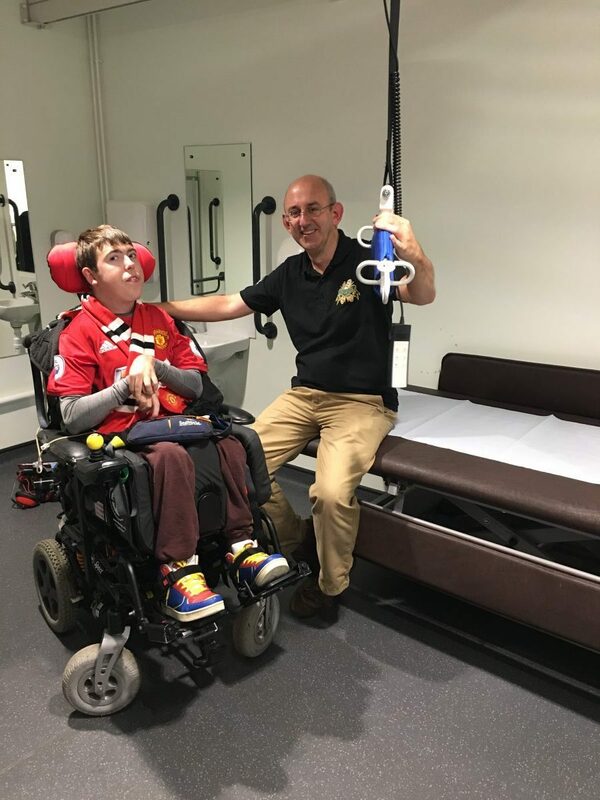 In spite of my negative comments about number of seats for wheelchair users, Manchester United has great facilities for disabled people, which other Premier Clubs should aspire to replicate. Unfortunately no football was played on my visit due to the bomb scare at Old Trafford. Sometimes these reviews can be difficult, and none more so than this. Often an accessibility review will be equally about what doesn’t exist, as well as what is in place. It’ll be a matter of record that on the day I visited Manchester United the game didnt actually take place. However, by the time the game was abandoned, I’d already experienced quite a lot. In the days running up to the match I’d received a helpful leaflet from MUFC saying that free parking was available right by the ground. All we did was give our name to the stewards and we were helpfully directed to the car park. Easy. Unlike a previous review we were actually near to the disabled fans entrance. We didn’t do much looking around outside but instead went into the ground. There is one access for all wheelchair users at Old Trafford, and again all stewards had been really helpful. The issue here, as with many other grounds, is that the three of us had to be separated. I knew United had recently opened a family area and emailed the club, but was told that it was for home fans only, which is fair enough. Inside the ground, the area seemed to be reserved for disabled fans and companions. Really pleasing to see 8 accessible loos. Also in this part of the ground was the Ability Suite. Here disabled fans could buy food/drink and generally relax. It was well used and people seemed very comfortable and relaxed in there. Once I’d had some refreshment we made our way into the ground. Our seat allocation was easy to find and stewards were, as ever, always willing to help. The view was quite impressive. But… there were things that concerned me and have done for quite a while. Manchester United is a big club and has invested heavily in it’s stadium. Sadly the stand that we were in is the only one that has spaces for wheelchairs. United fall well below the recommended spaces for wheelchair users. I think that’s really disappointing. I also felt that whilst an exclusive area for disabled fans suits some, it isn’t for everyone. I don’t know whether other areas around the ground were accessible. If I was marking Manchester United on existing facilities alone then I think it would be 4.5 out of 5. In the time we were there it did feel a little isolated from other fans, so my rating is 3 out of 5. Staff helpfulness top marks! I think there is so much potential for Manchester United to really show other clubs how inclusiveness can be taken further. And next season maybe I’ll see the game! It may seem strange to rate such a prestigious and usually very good ground so low, and I am lead to believe that things have improved immeasurably over the last few years, but this was my experience on the day of the David Beckham match for UNICEF, 14 November 2015. All of this has to be considered alongside the sheer volume of people, 75,000, and all looking to arrive and depart the stadium at the same time. The disabled parking, on the face of it not bad, until you consider its on the opposite side of the stadium to the one wheelchair designated entrance. Again, its a half mile walk around the stadium, ok on any other day, not with 75,000 other fans milling around. The low rating for access is really, if you have only one wheelchair access entrance, why put the disabled parking as far from it as possible? Also, on the day there was a shutter brought down the entrance to the disabled concourse, having got through the throngs to within 20 metres of the wheelchair entrance, in pouring rain, with two wheelchair users, the gate stewards felt comfortable continuing to bring the barrier down. There advice was we should wheel up a 1 in 5 incline slope, go around the museum in the crowds and pouring rain, to the other end of the concourse where the barrier way still be open. Not at all disabled friendly. Now for the c change. Once we got to the wheelchair entrance the staff and stewards were outstanding. They sped us through out of the rain, escorted both us and our carers to our seats and offered to get us a warm drink from the concession stand whilst we soak up the atmosphere. The staff and stewards in the stadium were beyond excellent, the experience inside the stadium was one never to forget. Outside however leaves a lot to be desired. Would I go again as a wheelchair user, in a new York second, the staff inside, the stadium, the atmosphere and the welcome at the wheelchair entrance more than made up for the shortcomings. I am not even going to mention the 3 hours it took to get back onto the M60. Since writing the previous comment changes have now taken place at Manchester United. The club have now introduced Family Accessible Seating, and we had the pleasure of attending a game recently. The Family Seating is very high up in the stadium, so may not be advisable if you have visual problems, but the option is there now, which wasnt the case last year. The Club have also installed a Changing Places Facility. This facility was very spacious, had a Hoist and a Movable Padded Table / Bed, as well as the usual Sink, Toilet and Waste Bins. We were also met by an Access Steward who guided us through the crowds to our seats, holding lifts and opening doors for us. She also came back at the end of the game to help us vacate the Ground also. 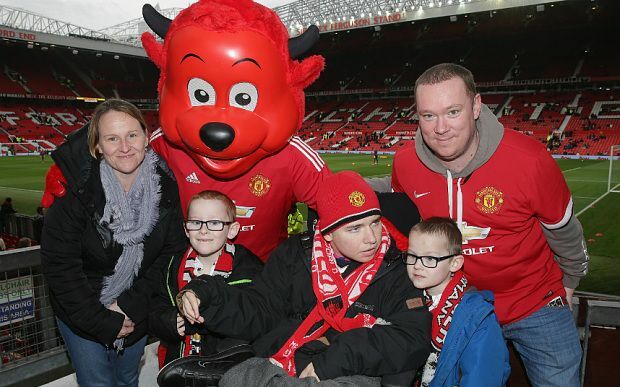 The Family accessible Seating is some distance away from the Food and drink Facilities, but once again, united have forseen this issue, and a United Staff member comes and takes your food and drink orders and goes to get them for you while you soak up the atmosphere or enjoy the game. A great turn around from the club in the last 6 months. And there look to be plenty more changes for the good coming in the near future. I unfortunately cannot rate the inside of the ground. I tried to take my Three children one of whom is a wheelchair user to watch a game. I was told by United that my two children could not sit with my older son a wheelchair user as they have a 1 wheelchair 1 carer policy. When i advised united that they were 6 and 4 years old, Manchester United sent me an email saying that maybe taking the family to Stockport, Rochdale or Oldham would be a better idea. Im a life long United fan and was disgusted with this attitude. The person who sent the email was the Disabled Liason Officer, and the secretary and First memmber of MUDSA. A absolute disgrace. This policy means that if you have a 2:1 ratio you too cant attend, or if you are a wheelchair user with 2 children, you have to pick one to take, and the other one will miss out. Thus my review, ease of access Rubbish, well i cant get in, and the staff helpfulness speaks for itself.